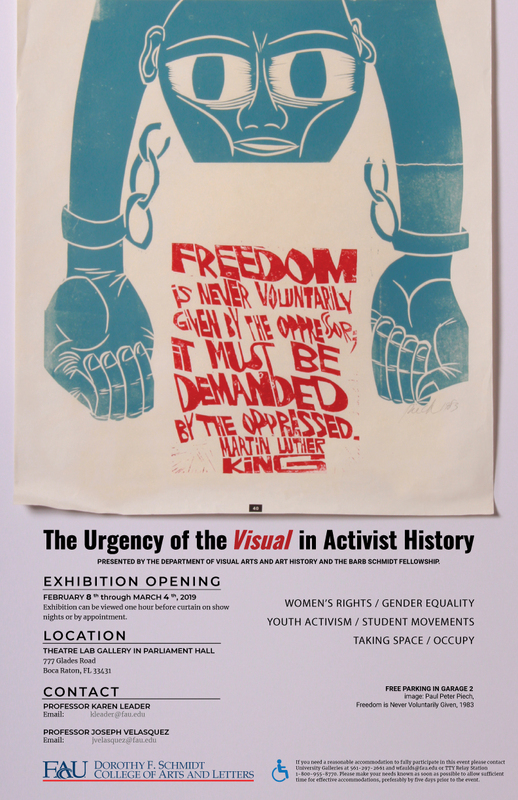 “The Urgency of the Visual in Activist History” is now on view at the Theatre Lab Gallery, Parliament Hall, on FAU’s Boca Raton Campus. The exhibition is co-organized by Karen Leader Ph.D. and Joseph Velasquez MFA, Department of Visual Arts and Art History, with student curators Sofia Honekman and Sierra Phillips, with Patricia Hood. Combining art and ephemera from FAU Library Special Collections with new work by FAU Printmaking students, responding to activist videos edited by FAU dual-enrollment high school students in the Barb Schmidt Fellowship, the themes include youth activism, women’s rights and gender equality, and the concept of taking space or “Occupy.” On view until March 4.